Hungry Jacks have released the vegan cheeseburger. Finally, a fast food restaurant is catching up with the people. Hungry Jacks in Australia is the same as Burger King in the rest of the world. Australians just have to have weird names for everything don’t they? How good is this cheeseburger and is it worth the money spent? It is not always easy to eat out when you are a vegetarian, vegan or looking for cruelty-free. To accommodate a big part of the worlds’ population, and let´s say it was about time, Burger Kind, A.K.A. Hungry Jacks released their vegan cheese burger. So what is the difference between a regular burger and the vegan cheeseburger? First of all it is vegan, that means that is made from ZERO animal products compared to their other burgers which contains several. IS IT THE OUTSIDE OR….. Looking at it, it is a big burger. I will never forget purchasing it and having to pay something ridiculous like $13 or something like that. I thought ” I better hope it is worth it”. Then receiving a big burger, I visualized a small cheeseburger but this is a decent size burger. The second thing that stood out to me was definitely the box ” 100% Australian beef”… I sure hope not! The burger starts of with it´s all vegan bun, lettuce, onion, tomato, vegan mayo, their vegan patty and ketchup. Let´s not forget the vegan cheese tho. The patty is made from corn, carrot and capsicum. With the corn being very visible. With all burgers you look at the pictures on the menu and than you get a burger that makes you question if this is even what you ordered. This is also the case for the vegan burger. But you know what they say. It is the inside that counts, perhaps this will be the true when it comes to Hungry Jacks vegan Cheeseburger. With the first bite I was very aware of the corn bits. I would have been more impressed with a more tasty patty than two of the same kind. The vegetables were as you would expect from fast food places but nothing I would complain about. The mayo was surprisingly good and I think I would rather have gone with double mayo, one burger and no cheese. The cheese was not that impressive but I will say that I have had both better and far, far vegan cheese. 3.5/5 I will not say to many bad things about this vegan cheeseburger but perhaps some spices would have been a nice touch, some spicy mayo with jalapeno vegan cheese or perhaps a juicy mushroom patty with some avocado? The best thing about this burger is that it exist and it has triggered something. It might still be a work in progress. However, it has started something and now the other fast food chains need to catch up. So thumbs up to Bruger King / Hungry Jacks for making it possible for vegans to go through the drive thru and enjoying some fast food on the go. If it is worth the money? Of course it is. Even if it might not be the best burger, Yet, It is worth purchasing to show support. If people won´t buy then they won´t sell which means no more vegan cheeseburgers. You are better of purchasing and then leaving some feedback with Hungry Jacks or Burger King with ways to improve it. Thanks to The Vegan Cheeseburger, Mcdonalds will be releasing it´s own vegan burger. I will be in the line up to try it. I am hoping that they will add some flavor to it tho. Now where does it say that eating vegan has to be boring or flavorless, quite the opposite. You always experiment with flavors, spices and vegetables. What will go well with what. We do keep things interested around the house that for sure. A few days ago we even made our own vegan cheese burger which I must say are 10 times better than the one from hungry jacks. The recipe is that follows. Recently I have been making a lot of hasselbacks potatoes. Very popular in Sweden. If you have not tried it than here it goes. Turn the oven on to 225 degrees Celsius, if fan forced lower slightly. Put your potatoes in a wooden spoon, and than begin slicing it, several thin slices next to each other, the wooden spoon will keep it from getting sliced all the way through. Place your potatoes in an oven tray. I usually melt some nuttlex butter in the microwave and than I add truffle oil into the butter. I love truffle oil so I add quite a bit. You can usually find truffle oil in your specialty shop. The with a brush or spoon, cover the potatoes with this. Save some for later as well. Leave for 20 minutes. After 20 minutes take them out, but more butter and truffle mix on. You can now add your cheese, a Parmesan is my preferred choice and than some vegan breadcrumbs to top it off. Back in the oven for another 20 minutes. When the potatoes go back in the second time I usually start with the burger. Get your choice of vegan burger buns. I usually purchase mine at Flannerys and I like to mix it up so whatever I feel like at the time. Sometimes I place it in between lettuce leaves. The patties are usually from vegiedelights, I love the spicy ones and the BBQ ones. On the buns I mash up half an avocado for each burger and some red onion. On the top bun I will put ketchup. When frying the patties I will put a slice of vegan cheese, preferably something with lots of flavor. If not I will add like paprika, chili, cayenne. Just to give it a little bit of something. When the patties are pretty much done I will put the cheese on the patties and put a lid over the frying pan. On the side I usually have a coleslaw or a salad. However, this is usually pretty filling. I hope you will enjoy both the review and the recipe. If you have any questions please feel free to ask them and you are more than Welcome to leave comments. I will get back to you as soon as I can. Previous Previous post: Cruelty-free soft drinks – fact or fiction? There are plenty of vegan food that tastes brilliant but I think the fast food places haven’t realized that perhaps they need some help to create something really tasty. Some of the products you can buy vegan in the shops are so good that my partner actually prefers them over animal products and he is not vegan. Thank you for this interesting post, I was patiently reading and scrolling down from beginning to end, I like vegan burger and I prefer much taste of corn bits, you didn’t talk about the cheese, I like the presence of mayo(double) and I can’t wait to have a taste of it. The cheese was nothing spectacular. There is however really good vegan cheeses, just need to find one that suits your taste. 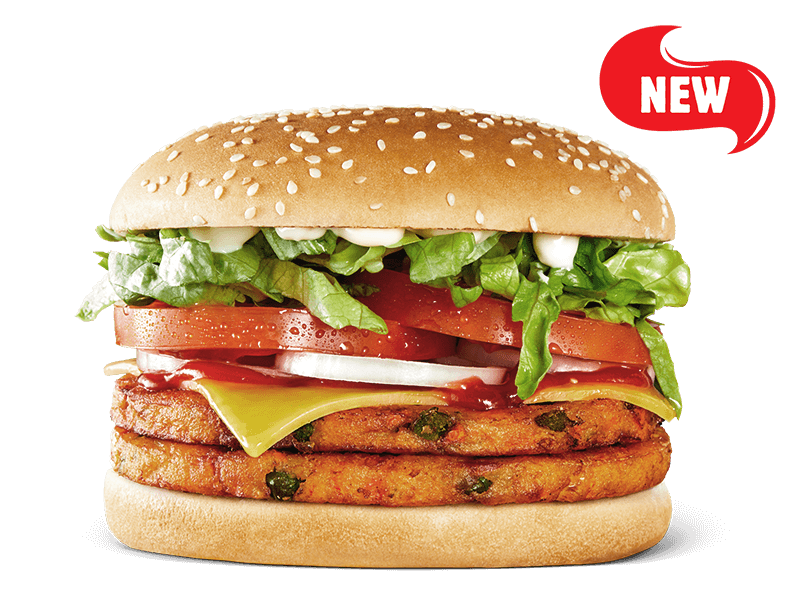 Burger King has the same cheese burger as hungry jacks but hopefully they willl expand with different types. As there are plenty of options for non vegans and vegetarian but only one if you are not a meat eater. The image and your ‘hands-on’ (literally) review of the Hungry Jacks vegan cheeseburger was so good it made me hungry to have one. From the ingredient it does check all the blocks for a vegan burger, only the box doesn’t fit! Good article, thanks for making me better informed today! I agree, vegan food has so many different levels of taste when it is done right. I am happy to hear. That looks really good! I’m not a vegan myelf, but honestly I would order one of those just to try it. I’ve eaten black bean burgers before and they are good, but taste a lot like a burrito. Is it like that, or do the patties actually taste like meat? and how about the cheese? Also, I had 0 idea that Burger King is called Hungry Jack’s in Australia. These patties does not taste like meat, they remind me of a sweetcorn fritters more than anything. They are not bad just not what you would expect. I have definitely had better cheese but also far worse. Yes, them Australians always have to be different.. haha.. I have been looking for places to eat vegan. They are hard to come by and most of the time they are not a true vegan. So it is refreshing to see an article on the subject and to know that there are some good vegan restaurants around. The homemade vegan cheeseburger looked better than the restaurant one. I think I’m going to try making my own vegan burgers at home. I actually prefer the homemade over the fast food one. The next one on the list to try however is the Carls Jr vegan burger, it has the beyond patty. Yum, homemade is always the best. I loved your article on the release of a vegan fast-food cheeseburger. A little over a year ago now I began my process of converting to being a vegan, as I believe in the energy transference eating meat has as apart of even consuming meat. I also believe that it leads to high blood pressure and over all makes me feel sluggish and actually more prone to being sad. After all we are what we eat as our cells retreat every 35 days base sole on what we consume. I love how you included your own recipe and it looks so good! I am very excited to give this delicious dish a try! I am agreeing with you. You are what you eat. After a few days on veggies and green juices everything feels lighter, even your vision improves which is odd. Let me know how you think it tastes. I would have to say that I am impressed. For a fast food restaurant to think this creative and create a cruelty free burger. That has gat to be a news wordy piece. I would most certainly love to have a taste of this. This was made to target a particular market and I think because of that, it is going to be a hit. Although I am pretty sure that those that are not vegans would still get a kick out of this awesome looking burger. I just hope it taste as good as it looks. My partner is not a vegan but he is trying to eat less meat, we had the burger together and he really enjoyed it. Anyone who is just looking for something other than meat or just wants to give it a try should as they might be surprised.